SKU: HDA04. Categories: Tools & Equipment, Power Tools/Hand Tools. Tag: belt sander. This floor sander is meant for sanding wood floors which are in good condition but need the top surface sanded down to be refinished. This sander can be used on either indoor or outdoor floors, but if being used outdoors make sure all screws or nails are driven below the surface of the wood. The sander weighs 140 pounds and requires two people to load/unload. We also carry sandpaper for this sander which is sold separately. This item requires the end-user to come in for full training on this unit and a standard 110v power supply. This is a 4000 rpm sander typically used for automotive/metal sanding. Sanding discs are sold separately. This item requires a standard 110v power supply. This floor sander is used to refinish wood floors have either warping in the wood or uneven planks where a lot of wood needs to be taken down fairly quickly. 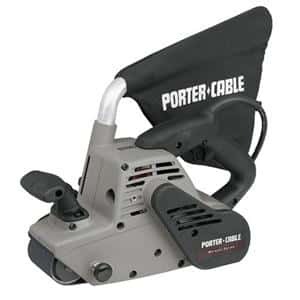 This is a very aggressive sander and could damage flooring if used improperly. This sander can be used on either indoor or outdoor floors, but if being used outdoors make sure all screws or nails are driven below the surface of the wood. The sander weighs 140 pounds and requires two people to load/unload. We also carry sandpaper for this sander which is sold separately. This item requires the end-user to come in for full training on this unit and a standard 110v power supply. We carry sandpaper in 50 grit, 80 grit, and 120 grit which are sold separately. This item requires a standard 110v power supply.